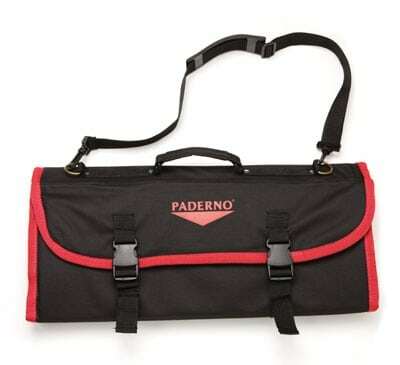 The nylon Paderno 18190-AA cutlery bag withstands daily wear and tear and rolls open to show all contents. So they are less likely to scrape against each other, the inside has several sleeves that hold and separate tools. When all tools are secure, the bag folds to a compact rectangle, with clasps that keep it shut. So employees can take it with them, the outside has both a shoulder strap and handle.